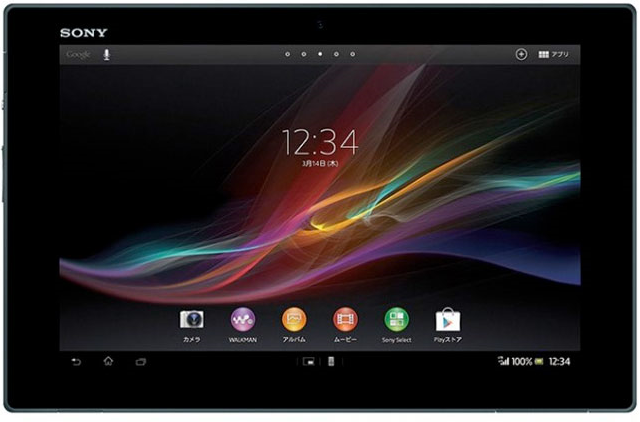 Sony has just officially announced a new tablet, the Xperia Tablet Z. Many Android tablets today look very alike to each other, and it's not very common to see a tablet with a very distinguishing feature, but this can't be said to the Tablet Z. As you'll see, it is extremely thin and light. In fact, it is revolutionarily thin and light, and these features are really distinguished from any other tablet out there. It's also impressive because high-resolution displays usually translate into thicker and heavier tablets, due to the higher demand that these displays have. However, the Xperia Tablet Z can keep its remarkably thin and light design, while still using a high resolution 1080p display. Funnily, Sony has never made any very noteworthy tablets, in my opinion, and so it came to me as a surprise that a major design innovation would come from them. At any rate, the Xperia Tablet Z is Sony's first tablet that is generally flawless, at least on paper. It excels in terms of design, display, camera, and also in performance. The only major flaw I can sense this tablet might have is that Sony might have made the battery smaller to compensate on the thickness and weight, and with a demanding display like this one, maybe battery life will be very compromised. Of course, this is just a theory of mine, unsupported by any evidence, so it may be completely wrong. At any rate, you can check the full specifications for the Xperia Tablet Z here. The display of the Xperia Tablet Z is not an award-winning screen, but it is surely one of the best. The resolution is very high, at 1920 x 1200 pixels, and with the display size being a standard 10.1", the resulting pixel density was 224ppi, considerably lower than the iPad's 264ppi and the Nexus 10's 299ppi, but its still much crisper than many tablets out there (the majority being 149ppi), and should be a delight to look at. For reference, it should have the same crispness as the ASUS Transformer Pad Infinity. Aside from that, it's an LED-backlit display, with a new Sony Mobile BRAVIA Engine 2, which enhances the display's vibrance. This is also the first tablet to be dust and water proof, hence enhancing the tablet's durability. While the Xperia Tablet Z has an array of noteworthy features, probably the most eye-catching feature is its remarkably thin design. The Tablet Z sports a design with very squared edges, with a pretty wide bezel, with a Sony logo placed on the top left of the bezel. On the back, you get a very simplistic, all-black (or all-white) casing, with an Xperia logo on the center. One strange flaw of this tablet it that the rear camera is placed on the very top right edge, where your hand would usually be if you use the tablet in landscape mode. This, I think, is a very awkward positioning for a camera, and ruins the entire design of the tablet. Last but definitely not least, the tablet is just about the thinnest tablet in the world, measuring just 6.9mm thickness, which is actually even thinner than the iPad mini, and its weight is also very distinguished: 495g, 30g lighter than the previous owner of the "thinnest tablet" title, the ASUS VivoTab RT. The iPad 4's 652g looks like a brick compared to the Tablet Z. The Tablet Z seems to the the one to beat in terms of design for 2013, I wonder how quick will other manufacturers be to catch up to this new standard. I consider the SoC (System-on-Chip) inside the Xperia Tablet Z to be the third strongest current SoC available (not counting upcoming SoCs like the Tegra 4, Exynos Octa or Snapdragon 600/800), which is a Qualcomm Snapdragon S4 Pro APQ8064 chipset, and is only generally outperformed by the Exynos 5250 and the Apple A6X. Yes, this is the same Snapdragon S4 Pro that powers the almighty Nexus 4. This Snapdragon S4 iteration packs four custom Krait cores ticking at 1.5GHz, plus an Adreno 320 GPU. This SoC, aside from delivering very good performance, also promises extensive battery life, since the Krait architecture is designed for lower power consumption than other ARM-based CPUs and also because the S4 is built on the newest 28nm process. The S4 Pro is relatively new to the market, and I believe this will be the first tablet shipping with this SoC, however, the end of 2012 has seen a very fast growth in competition in terms of compute power in both the Android and the iOS platforms, referring to the Exynos 5250 and the Apple A6X, and as a result of that, the Snapdragon S4 Pro collapsed from the top of benchmark charts. Actually, its CPU power still remains the second best, with its performance being more than the Dual Swift cores in the Apple A6X, but less than the Quad Cortex-A15 cores in the Exynos 5250. Still, being only outperformed slightly by the Exynos 5250, the S4 Pro still has the second best CPU on the mobile world. Unfortunately the same can't be said for the GPU, which is where Android devices usually fail. Before Q4 2012, the Adreno 320 GPU was at the top of GLBenchmark's charts, outperforming both the iPhone 5 and the iPad 3 by a tangible amount. But then came along the iPad 4 with its PowerVR SGX554MP4, which stole the Adreno 320's crown as top performer, and then came the Mali-T604 in the Nexus 10 and pushed the Nexus 4's Adreno 320 GPU to third place. There is a tangible difference between the Apple A6X and the Snapdragon S4 in terms of GPU performance, but still, the Adreno 320 is an excellent performer, and should be more than enough for any mobile gamer, maybe even for quite some time in the future. Plus, the Xperia Tablet Z has the lowest resolution in comparison to the Nexus 10 and the iPad 4, which neutralizes slightly the performance gap between these devices' GPUs and the Tablet Z. So, basically, the Xperia Tablet Z is a performance powerhouse, and should provide a lag-free experience on both UIs and in (most, at least) games. The Xperia Tablet Z also has an 8MP rear camera, which can record 1080p video, and, surprisingly, a front-facing camera of 2.2MP which can also shoot 1080p video. The tablet will come with Android 4.1.2 Jelly Bean out of the box, but naturally I suspect an Android 4.2 update should come shortly after the tablet's launch. Well, it seems like there is a lot to look forward to with the Xperia Tablet Z, which is obviously a huge step forward in comparison to the company's last attempt at a tablet, the Xperia Tablet S.